This is my Sasha Toddler and Baby Dress. Baby always needs new clothes and I like to dress her like Sasha. Many of the little prints just look so sweet on her. With matching undies and a little hat trimmed in lace, baby is ready for any holiday. I love this new toddler and am thrilled that all the little dresses I have made up for Baby Sasha fit the new Sasha Collection Toddlers! 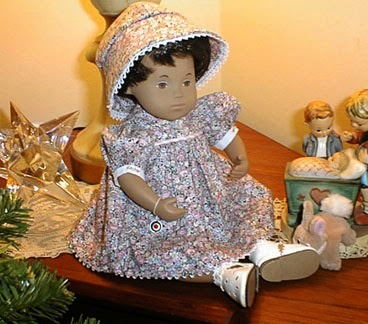 Includes instructions and patterns for: Sweet gathered dress with high piped yoke; short gathered sleeve with cuff; reversible sunhat; and undies. This simple little dress is so easy to sew and in no time you have made a wonderful little outfit for your toddler or baby. I use fat quarters for all of these dresses. You can make matching sister dresses for your Sasha's and Toddlers and Baby's which would be very sweet. I have made these dresses in every holiday fabric and they turn out adorable. Pattern emailed with payment of $8.00 through paypal.